During my university years I attended the left-leaning school Simon Fraser University, and was exposed to many different theories on politics, and became quite active in student politics on the campus. Though I never studied the works of Leon Trotsky and Karl Marx in depth, I read a few of their shorter readings about Capitalism and Communism. We can all see today that Communism in it’s form of the time failed miserably, and that our current Capitalism is showing major signs of failure too. 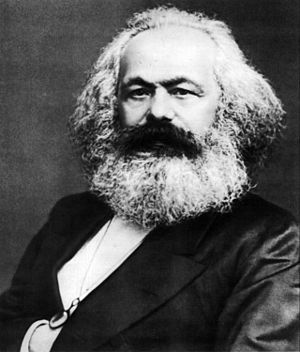 When I saw the following article written by someone at the Harvard Business Review asking whether Karl Marx was right in his predictions of the failures of Capitalism, I was interested too! I hate to see people suffer. I hate to see people suffer for the sake of profits and greed. I have no answers on how to fix the world’s financial woes, but reading lively debates and seeing smarter people than me looking around for answers gives me some piece of mind. In case you’ve been on Mars (or even just on vacation), here’s a surprising idea that’s been making the rounds lately: there might have been something to Marx’s critiques of capitalism after all. via Was Marx Right? – Umair Haque – Harvard Business Review. Marx’s critique of capitalism was more right than wrong. Marx’s critique of human nature was more wrong than right. Nice picture (s). That’s a great way to put it! I like it.